This Newsweek cover from a couple weeks ago had an unconscious irony. Perhaps Newsweek’s wizards are not aware that socialism quickly degenerates into nothing more than economic thuggery. But as long as the New Socialism works out well for the media-political elite, who gives a rat’s patooie? Reagan talked the ailing Soviet Socialists in from their ledge of idiocy to knock down the Berlin wall and thanks to 8 glorious years of G.W. Bush, we get a resurgent Democrat Party waving the Socialist flag. Well, now that the nation is flat broke, at least it’s been softened up for the kind of institutionalized penury…… for all but the Bolsheviky Apparatchiks……. that comes with Socialism. What an unmitigated farrago. 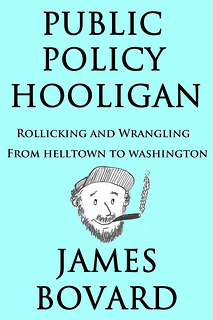 Osama bin Laden executed the most asymmetric Rope-A-Dope in all history wile our “First MBA President” presided over the biggest lapse in business sense and most spectacular abuse of Fractional Reserve Banking in history. I’d be cheered by the opportunities of satire but as we all know, Socialist Governments eat their native satirists first. 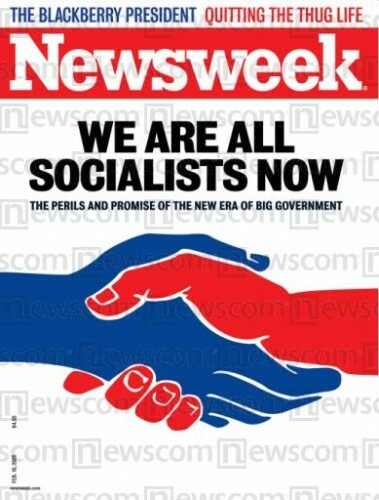 Though Newsweek should get points for attention getting style, everybody should clearly know this aint Socialism we’re getting but then, a mugging is always just a mugging. Dirk, I suspect that it may be worse – it may be a boarhawging instead of a mugging. Perhaps “Brace Yourself Bridgette!” should be unofficial motto for Obama’s economic policy. be for you. Just remember, in a party of 100 with only 99 chairs, all the chairs shall be broken and burned so that all are equal in their enjoyment of no chairs. Thus sayeth the World Improver…..before cleaning his gun. Dirk, I guess you were raised in the Appalachians. “Ain’t, cain’t, & boarhawg” – the three most popular verbs back in the mountains.